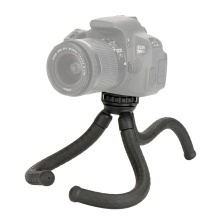 Combining Hardness with Softness: The high-elastic tripod leg is tough and durable so that it can be bent repeatedly without breaking. Free Transformation: It adapts to different environmental needs: Stable, tough, long-lasting, changeable (waterproof, easy to clean, lightweight). Crack Resistance Design: Embedded seamless connection and high-elastic plastic three-dimensional design for durability. Universal 1/4 Inch Screw: Max. load capacity is about 2kg. Suitable for action cameras, ILDC camera, pocket cameras, DVs. Also suitable for smartphones if you use a proper phone holder on it. Waterproof and Corrosion Resistant: Highly elastic plastic with corrosion resistance for shooting in sea water! Phone holder, phone and camera are not included.